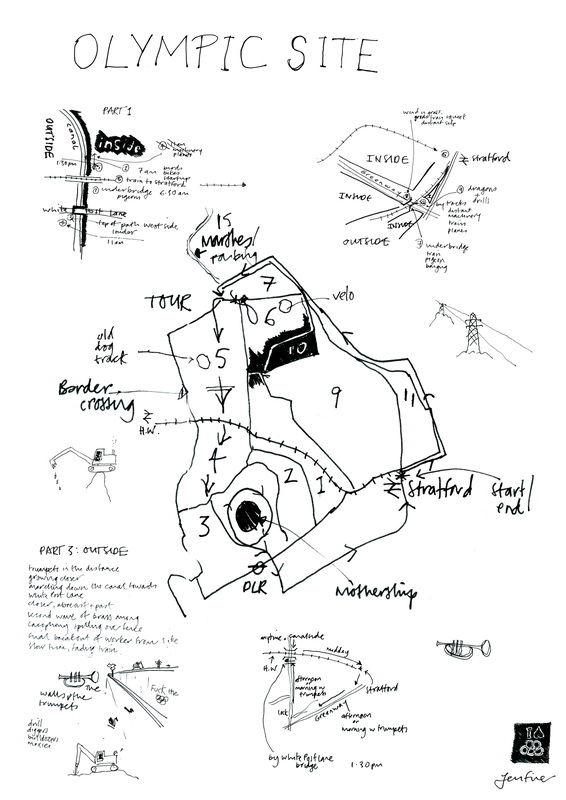 A "sonic map" of the London 2012 Olympic Site, made in 2008 for the show SoundProof. The map, Rise and Fall of the Olympic State Map, is part of this, as is the film Blowing Down the Blue Wall. A blue wall surrounded the Olympic Site in East London, a relentless and unstoppable barrier to exclude feral elements from the kingdom of construction. The invitation to make a "sonic map" of the site was ridiculous from the start - as one was not allowed in, the commissioning of such a work was rendered pretty much absurd. Thus the focus became the wall. The map provides an overview of the structure of the audio's 3 parts ; outside the wall, a guided tour of the site (inside the wall) & outside the wall again, trying to trumpet it down.